Meyer Meibergen and Marinus Godschalk, cousins from Holland, came to Enid by way of Kansas and opened Meibergen & Godschalk Mens Clothing in 1893. Their store remained open until 1944, always run by family members. In 1899, Abe Herzberg and Samuel Renberg ran Herzberg’s Department Store. Hirsch Bros. Clothing store was opened in 1902 by brothers Max and Albert Hirsch. They were later joined by their brother, Morris. 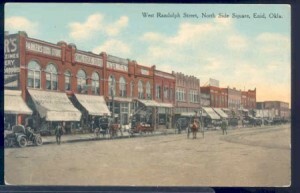 The store closed in 1919. In 1904, Herbert Kaufman and a brother arrived in Enid and opened a dry-goods store. The Kaufman’s store remained in business until 1940. Around the same time, Leopold and Julius Meis ran another clothing store, as did Harry Woolf. Albert Loewen built the elegant Loewen Hotel in 1907. In 1909, Robert Aronberg and Edmund Klein co-owned Model Clothing. Charles Lowenstein owned a tailor shop, and in 1913, Frank Locke, later of Ponca, was a tailor. In 1897, Joseph Meibergen was elected Mayor of Enid. 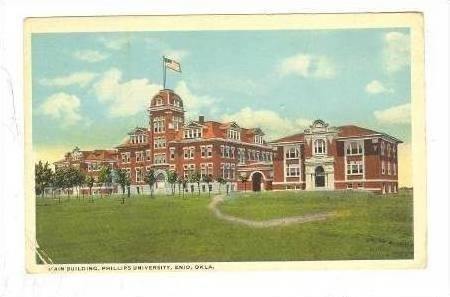 In 1906, Albert Loewen served on the committee that succeeded in bringing Phillips University to Enid. Temple Emanuel Congregation was chartered in 1911. The synagogue affiliated with the Reform movement’s Union of American Hebrew Congregations, (UAHC), between 1910 & 1919. Rabbi Joseph Blatt served the congregation during many of these years. The congregation met in various locations: Seventh Day Adventist Church, Loewen Hotel, and the Masonic Hall. Temple Emanuel never had permanent building. Its high point was 1915 with 15 member families. The religious school met in the Loewen Hotel. The Founding Trustees of Temple Emanuel: Harry B. Wolf (or Woolf), President and men’s furnishings salesman; Isadore Gratz, secretary; Albert Hirsch; Robert Aronberg; Charles Lowenstein; Marinus Godschalk; and Herbert L. Kaufman. The congregation disbanded in 1930. Intermarriage may have caused its decline. A Jewish Section was dedicated in the local Enid Cemetery. In 1924, a B’nai B’rith lodge was founded with 20 members. Sol Newman was President. Enid’s non-Jewish citizens were very supportive of their Jewish neighbors up to and throughout WWII. Henry J.Tobias, The Jews of Oklahoma (Norman, University of Oklahoma Press, 1980). Regina Merwin is curator for this Enid, Oklahoma exhibit.